The Polar M430 is the first genuine successor to the much-loved Polar M400. With almost three years between their launches you'd expect more than just a spit and polish from the Finnish sports tech giant. Fortunately, we've got a lot more than that. The M430 includes built-in GPS (with low-power modes), a six-LED heart rate sensor and better indoor activity tracking, thanks to an upgraded accelerometer and tweaked software algorithms. Despite the M430 being 0.5mm thicker than the M400, at 12mm, because of the heart rate tracking smarts, Polar has actually managed to make it 5g lighter, tipping the scales at a pretty-reasonable 51g. Like the M400, it's not exactly a looker. But is that really all that important for a running watch? I don't think so. And it's hardly a monster either. I've been test running the bright orange model (a black and white version is also available) and, while it goes with approximately 0% of the shirts and t-shirts I own, it does have something of a retro charm to it. Maybe that's because of the monochrome 128 x 128 display – exactly the same one found on the M400. Would a touchscreen have been welcome? Maybe, but part of the appeal of the M430 is its simplicity. It's the same super-simple five button control setup that we saw on the M400 – and it just works. You won't be swiping around trying to find the screens you want – it's as easy as going up and down until you find the menu or feature you need, using the top and bottom buttons on the right-hand side, and selecting what you want using the middle button. The left-hand buttons go back a screen (bottom one) and turn on a back-light (top one). The strap is a bit cooler too. Quite literally, as it has a lot of little holes on the softer silicone strap. The Polar M430 isn't a customisable smartwatch by any stretch but there are four new watch faces on offer, with my favourite being the one with the little stick man who makes you feel like a lazy git when you aren't moving by sitting on his little stool, and a champion when you're on the move by walking with you. The Polar M430 is a running watch first and foremost. It may have other sports modes on offer – more on that in a bit – but they are only really extensions of the main event: GPS run tracking with heart rate monitoring. Again, Polar hasn't messed with the winning formula from the M400 – it's just a case of pushing a button (middle, right) and going. Well, if you've set Running as your preferred tracking option in Polar Flow that is (it's set by default). Tap once to get the run screen fired up, then wait for your heart rate to show and for the GPS fix to lock on, and then push again to get started. On the move you'll be able to scroll through various screens displaying pace, speed, time, bpm – and a whole load of variations of those main ingredients. All runners are different in terms of the stats that they like to see when they are on a run, so it's great that you can customise the order of the screens to your taste. Getting a GPS fix is a lot quicker on the M430 than it was on its predecessor – so no more standing around on street corners waiting for that counter to hit 100%. Polar will have you believe it's because of the SiRFInstantFix tech built in. It's probably that (although it's an ageing GPS chipset itself, the same one found in the Polar V800) but we'd also guess that GPS firmware has come on a fair bit in three years. Whatever it is, it's much quicker and much less annoying. Just like the M400, M600 and V800, there are a wealth of running and training modes on offer – both from the watch itself and from within Polar Flow. Before you go running you can set up your own schedules using the Running Program section on Polar Flow, choosing to train for a 5K, 10K, half marathon or marathon, with a training plan that Polar thinks will fit you. Post-run feedback on the overall training benefit from the work you've just done comes from Training Benefit, Recovery Status and Running Index. These help you determine whether you've been burning fat or improving cardio, how your running is improving based on heart rate and speed and what effect this has had on your body and fitness. Polar's Smart Calorie counter takes into account your height, weight, age, gender and activity levels to form a much more accurate estimate of the calories you are using during your runs too. If you want to run indoors, without a paired-up footpod, you'll have to rely on Polar's improved accelerometer for treadmill tracking. I did two indoor runs with the M430, both 10km according to the treadmill. These tracked as 9.85km and 10.2km. So, while the M430 both under and estimated the actual distance, I think it still produced a decent estimate. As mentioned above, the M430 is very much a running watch. Sure, there are swimming and cycling modes, but these are very much additional extras. Consider swimming, for example – there's no open water mode and no lap detection when you're in the pool. 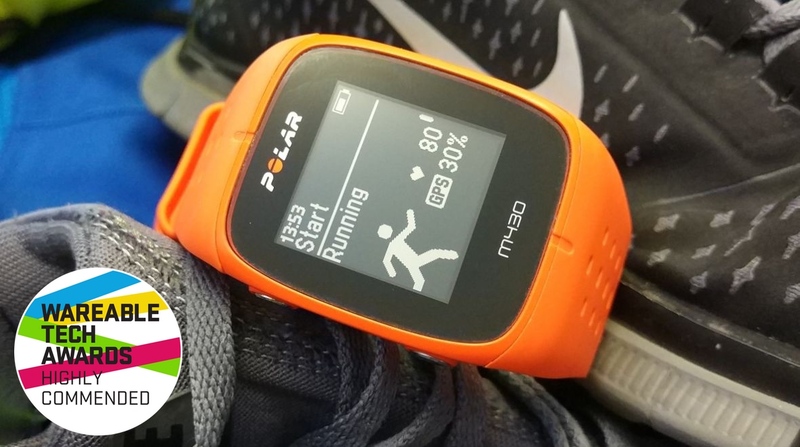 Essentially, with 'other' sports on the M430 it's just tracking exactly what it does within the running mode – heart rate, distance, speed and pace. Our advice is, if you're in the market for a swimming or cycling (or triathalon) assistant, you'd be better served elsewhere. As with the M430 and M600, whatever sports modes you do want served up on the watch, you simply select and drag into the order you want using Polar Flow. However, the M430 is a pretty competent everyday fitness tracker – with the usual array of lifestyle tracking metrics on offer such as step counting, calorie burn, active time and sleep. The M430 lacks a barometric altimeter however, so there's no counting stairs. I used the M430 alongside a Fitbit Charge HR for a couple of days and found the step counting much of a muchness – with a discrepancy of only around 2-3% in two days of around 12,000 steps. For an algorithmic measurement, I'd say that's more than acceptable. You can see a real-time snapshot of where you are at, activity-wise, compared to your goals on the watch. One of the watch faces has a nice little animation to display it, but you can also see the stats by simply selecting the My Day screen. One nice feature of the M430 is the on-watch Fitness Test. You simply have to sit still for a few minutes to get your VO2Max result, using heart rate fluctuations at rest. It's probably not lab-quality, but it is a score that I saw change over time as I believe I got 'fitter' while training for a big event. The Sleep Plus intelligent sleep system, which was introduced on the Polar A370 fitness tracker, promises to detect sleep duration, timing and quality of sleep based on position and wrist movements. I'll be honest – I'm not a fan of sleep tracking from wrist-based devices as a rule, and any 'results' I get are always skewed by me being disturbed all night by wearing something on my wrist when I'd rather not. That said, I found it pretty good at deciphering when I was drifting off to the land of nod and the breakdown of REM, light and deep – combined with the labels 'Actual sleep' and 'Interruptions' – in the morning was quite interesting, even if it was a bit irritating having to score my sleep on a scale of 1-5 (surely the watch is supposed to work that out for me?). Still, I'm not entirely convinced that accelerometer-based sleep tracking is ever really a feature that should be convincing you to buy a product – especially a product that's essentially a running watch with extras. When we spoke to Polar USA President Tom Fowler earlier this year, he insisted that we'd be impressed with the the bpm accuracy of the M430, explaining that he had seen a difference of 1-2bpm at most when using a chest strap against the M430's HR sensor in testing. This is apparently because the GPS watch uses six LEDs as opposed to four. Polar's Android Wear smartwatch, the M400, also had this setup and we were thoroughly impressed with its bpm skills. Just as we were with the Polar M430's. The first couple of times I compared it to a chest-strap (the Polar H7) it never strayed from 1-3bpms within mid-level training zones and wasn't more than 3-4bpms off the mark when I pushed it (and me) to some high-level heart rate readings. I thought it was best to put the M430 up against a non-Polar chest strap too and did so with an intervals session on the treadmill, while strapped up to a Suunto Bluetooth Smart. Again, the results were impressive. As you can see in the two graphs below, the 180+ bpm peaks of my three 'sprinting' stages were picked up, and very similar, from the wrist and by the chest-strap. As I found while testing the Polar M600's sensor the watch was a touch slow to react to spikes and drops – chest straps always pick up dramatic changes quicker – but once it did catch up after a few seconds, the high readings were pretty much on a par, or at least consistent with those deviations mentioned above. However, while all of the above sounds great – and for me means the M430 is probably the best wrist-based HRM I have used – there is a bit of an issue here. Michael Sawh, Wareable editor, has dark skin. And when he tested the M430 he couldn't get a reading at all. Not great and something we have asked Polar for clarification on and it has since admitted that there were issues with the sensor taking readings on dark skin. It has since issued a firmware update and we have since retested. Thankfully, it does work and offered similarly solid results. Included in that firmware update is the addition of continuous heart rate monitoring, so now outside of training events, you can keep an eye on daily bpm readings. That means you can now continuously monitor your bpms like Polar's very own A370 or Garmin's Vivoactive HR (or many other devices) do. And you can't actually turn the heart rate reading off during training, which is a bit annoying. I'd have liked to have saved a bit of battery life on a couple of huge sessions I did (training and then doing Race to the Stones). The Polar M430, as with all Polar wearbles, syncs up with the Polar Flow platform, either by USB cable and your PC's FlowSync software (which, in turn, fires up the browser version of the platform), or by Bluetooth to your smartphone by holding down the back button. I won't go into detail here on what Polar Flow can and can't do – we've touched on a lot of the features specific to the M430 already in the review. Just on the spec-sheet alone you can see that the M430's battery is a boosted one from the M400 – 240mAh versus 190mAh. But there's even better news as Polar has added some low-power GPS modes to stretch the life even further. With High Accuracy Mode you'll get one second recording, with a GPS point plotted every second, for super accurate distance tracking. The advertised life span for this is eight hours, although we went to eight-and-a-half during the Race to the Stones 100km race and it still had a bit of juice in the tank. Medium Accuracy Mode turns the plotting down to twice a minute and Low Power Mode means just one every 60 seconds. HR readings, on all three modes, are once per second. Medium results in a battery life of 16 hours – and it's 30 hours for Low. If you're an ultra-marathon runner, these figures will be music to your ears. Like the M400, there's that handy compass return-to-start mode if, for example, you get lost in the windy hills of the Algarve and can't find your way back to your hotel. For example. Annoyingly, whereas the M400 used a regular ol' Micro USB for charging the M430 has a new, proprietary port (wahoo, another one for the collection). Many people reported waterproofing issues with the M400 and its regular port – so hopefully at least this new version will mean an end to that. It's 2017, so of course the M430 has smartwatch notifications, this time with vibrations instead of tones. Third party apps such as WhatsApp and Snapchat are supported too, so it isn't just a case of texts, calls and calendar alerts. The Polar M430 isn't the top-end Polar running watch – that honour belongs to the V800. But, given the V800 is older than your nan and looks like a smartwatch from 1997, I'd say the Polar M430 is the best Polar running watch, even without some of the features of its ancient brethren. It's certainly a step up from the (still a good buy) Polar M400, with the heart rate tracking in particular impressing me (and my pale white skin). Sure, it looks a little basic and sure, it's not exactly cutting edge on the display front but, if you're looking for a reliable, accurate GPS running watch with a great battery life – at a decent price – then you should definitely consider the M430.